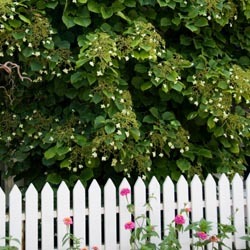 Climbing Hydrangea – An excellent deciduous vine with glossy leaves and cinnamon colored exfoliating stems. White flowers bloom in early July. Easily climbs on masonry, reaching 10-20’ tall. Oakleaf Hydrangea – An upright, irregular shrub that grows 4-6’ tall. Large leaves have excellent fall color. Creamy white flowers in July. Tolerates shade well. 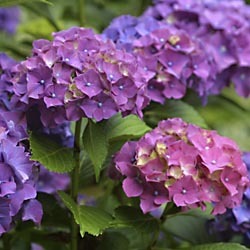 Bigleaf (macrophylla) Hydrangea – Blue or pink flower clusters (5-10” across) appear in August. Flower color depends on the pH of the soil. Acid soils produce blue flowers, whereas alkaline soils produce pink blossoms. In garden settings, their colors can be changed by adding either sulfur or lime, depending on the color you want to achieve. Blossoms are produced on last year’s growth, so prune just after blooming. Pee Gee Hydrangea – A small, low-branched tree that grows 10-15’ and arches under the weight of large flower clusters. White flowers bloom in July, turning pink and then brown with the first frost, holding on through winter. Flowers appear on previous year’s growth, so prune right after flowers start to turn pink. Mopheads and Lacecaps – Which is Which? Before you get the urge to dash out and buy the first hydrangeas that catch your eye, it’s wise to learn the difference between “mopheads” and “lacecaps.” As peculiar as these names sound, they truly are the names designated to two cultivar groups of macrophylla hydrangeas, and understanding the difference between them can help you choose the flowers you prefer. Garden hydrangeas, also known as ‘mopheads,’ feature large round flowerheads resembling pom-poms and bloom from mid- to late summer. Mopheads bloom in solid masses, their clusters often so heavy that they cause their stems to droop and bend with elegant arches. Lacecap hydrangeas bear flat round flowerheads with centers of fertile flowers surrounded by outer rings of sterile flowers. 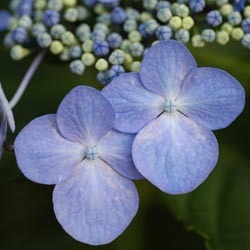 The fascinating flowerheads of lacecap hydrangeas are also somewhat reminiscent of pinwheels. You will be delighted with the versatility of these lovely shrubs, so relax and enjoy their beauty!